retreat as part of the Basic Program. Lama Yeshe’s and Lama Zopa Rinpoche’s vision for education in action has taken another step forward with Basic Program (BP) graduation ceremonies in Italy, Australia and the Netherlands. Designed by Lama Zopa Rinpoche as an integrated program of Buddhist studies suitable for a contemporary setting, the Basic Program is a practice oriented transmission of the Buddhadharma that takes students beyond introductory-level study and practice. Based on the lam-rim, the course takes up to five years. In 2007, twenty-two students received the Basic Program Completion Certificate, a reward for completing all the subjects of the core curriculum and the lam-rim retreat. 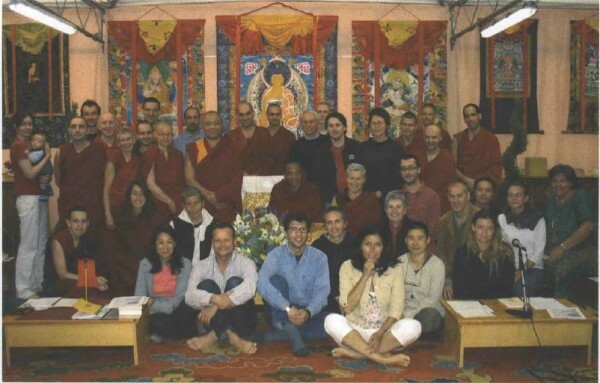 They also had to satisfy the Basic Program criteria for behavior and conduct – practicing to refrain from killing, stealing, lying, sexual misconduct (adultery) and intoxicants, while developing their concern for others and awareness of positive and negative states of mind, and developing the practice of patience and the bodhichitta motivation over the course of their studies. A number of FPMT centers worldwide currently offer the Basic Program on either a residential or non-residential basis. The Basic Program is also available as a Home Study Program.